Senior Programs Manager Lisa Sydnor recently retired from the Salvation Army Central Oklahoma Area Command after 50 years in non-profit service. Lisa Sydnor’s family has a pool going. As her third retirement begins this month, many of her family members are betting this one will last about as long as the others have. 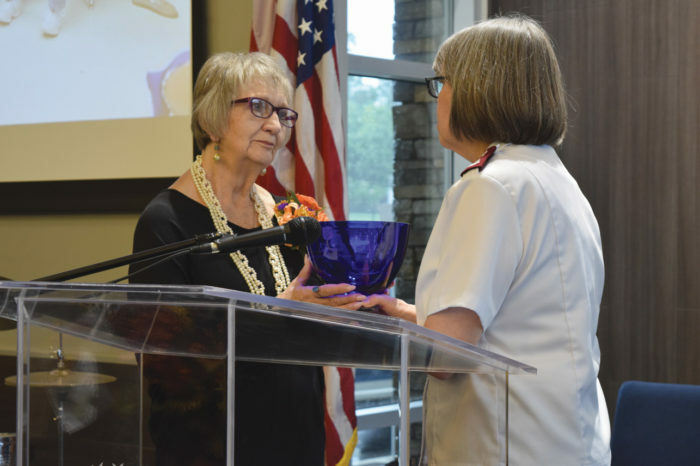 For the past 50 years Sydnor, most recently the senior programs manager for the Salvation Army Central Oklahoma Area command, has been helping people put their lives together. Whether it’s raising funds or raising families up when they have no place to go, Sydnor has devoted her life to helping others. More than 50 years of Sydnor’s life have been spent in the non-profit world. She started with the Oklahoma Museums Association in the mid 1970s doing a little bit of everything. “I was the secretary/bookkeeper/go-to-gal,” Sydnor said. Her boss gave her the ideas and she was expected to run with them. It was rewarding and Sydnor embraced her autonomy and her mistakes. Fortune smiled on her and she began 10 years with the YMCA in fundraising. From there, Oklahoma City University was her new home under Dr. Jerald C. Walker. “He was convinced we could raise money for anything and because he was convinced that we could we did,” said Sydnor, who managed the many of the university campaigns. From there the American Red Cross came calling. She was there nearly another decade. She started out as a chapter solutions manager. It was a title she wasn’t quite sure of. “My boss said it was a brand new position and this is what we want the end result to be but we don’t quite know how to get there,” she said. There were another 25 employees just like her across the country in the late 1990s. Helping mom and pop Red Cross Chapters consolidate and work together was part of her job. She met resistance but still had fun. She took her skills to Montana and Wyoming and worked her magic again, helping the Red Cross become efficient. Sydnor found her herself getting all the credit for the successful fundraisers after disasters. A year in Dallas and three years at another company and one month of retirement bridged her gap to Salvation Army. “The Salvation Army has given me … the icing on the cake,” Sydnor said. “I got to help so many people and it was just blessed by God. It seemed like every time we wanted to do something we were able to do it because we got the money and we could serve people. Co-workers say she’ll be missed. “Lisa is soft spoken yet strong willed,” said Keri Griffin, Salvation Army food services manager. “She is a woman of integrity who stands firm on her word. She will confront any and every situation or hardship until the job is finished and everyone around her is satisfied. Her tireless effort will be remembered.